Could someone please help with a problem I'm having with the PBY. It only happens with the PBY-6A. The DME radio doesn't come on at all. No readout what so ever. I saw in an older thread where Finn had told another user a while back that there was an issue with version 1.2. He gave him a link to the hotfix for the panel.cfg. This users problem, he posted a picture was identical to mine. However the link to the fix was dead. It was some time ago. Could someone either point me to this file or even tell me how to fix it. I've tried everything my limited knowledge will let me do. Thanks ahead for any help! Never mind about the help. I figured it out myself, with a little help from an older post. Thanks to Snave for answering the other guys question which answered mine as well. It was a spelling error in the panel.cfg file. The post was several years old. You think Aerosoft could have corrected it and re upped the file since I just bought it. Oh well no harm no foul, I guess. Great airplane by the way. Glad to hear you sorted it out, this is planned to be included in the next update, however since the developers are urgently needed in other developements we don't have any schedule if that update will come. Thanks for the reply. The fix was so simple not sure a whole update would be needed. Just a matter of a spelling error in the panel.cfg file. Great airplane, hate I waited so long to pick it up! Hi Merlin would you please share this spelling error so I can check it on mine? thank you and best wishes. Where we can find this panel.cfg ??? I made bold what you need to change. Basically the 098 needs to be 09 and it will work. By the way the thanks should go to a gentleman by the name of Snave in an older post here in the forums. Hope that helps! Here part of my Panel.cfg from "Aerosoft_PBY-6A_Civ\panel" it looks fine to me. Any ideas? Can anybody else confirm this? We are unable to see this issue on our machines. The typo in the panel.,cfg has been fixed years ago. I had solved the problem (ADF, but not DME) by changing the "AS_Caty.cab". I forgot who gave me this file, on this forum, sorry for him. I could give my MEGA link, by MP. Despite the update, ADF and DME, still does not work, I was forced to apply the above solution to find, only the ADF. P.S. : can I put on this forum my MEGA link ?? I have the exact same problem in Prepar3d 3.4. No display on the ADF and DME. Thanks CRO. I installed the files and it did indeed fix the ADF but I also got an error message so something got corrupted when I installed the fix. I had to re-install the Cat so I will live without the ADF and DME for now. Maybe the guys @ Aerosoft will figure it out at some point. Any update from Aerosoft on this? The main issue is that we simply can't recreate this issue. I promise it will be looked at. I can confirm this problem is still present in v1.22. 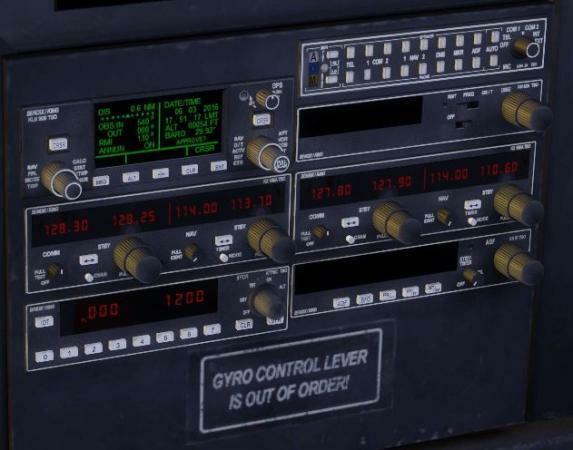 The typo gauge098= is still there (in panel.cfg for calypso & ausblackcat, not in the dutch variant) and DME & ADF don't work on any civilian variant. Also, the "Oh no, that's not the right aircraft!" message still pops up when loading one of the two midway variants. I will check this later this week. I also have this. Anything further folks? I tried it on three systems, just can'rt recreate it at this moment. Thanks Mathijs. Please keep it in mind if you can. I installed it into my new P3D V4 with the new installer and the issue is there. I have the same issue in P3D V3. I need to try reinstalling with windows defender off, UAC already off. I doubt its the reason but worth a try. I do not use any anti virus just windows defender in win 10. One thing I have noticed is that the aircraft registration plate above the radio stack is also black and missing. You can see it in the screen shot above and I see it in my cockpit. Tried installing with UAC and windows defender off and its got worse I have now lost all the radios apart from the GPS. I will remove it from both P3D V3 and V4 and clean up my system of any Catalina files clean the registry too. I think we may have some older files from older catallina installs floating about and messing things up, she has been with us for many years. I have not had to rebuild my pc for 5 years. Its a very stables PC I have kept it up to date with all the updates for Windows, drivers, bios and chipset drivers.